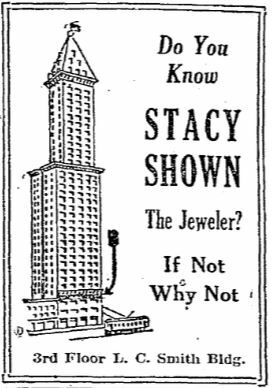 The street clock of Stacy Shown’s jewelry shop stood outside the Smith Tower for many decades. Shown, his wife, and their daughter all died within just a handful of years, bringing his store to a close. Before that, though, they were Seattle’s biggest baseball fans. Stacy Shown came to Seattle from The Dalles, Oregon in 1892 at age 24. He worked as a watchmaker for pawnbroker R. W. Barto for a few years, and then G. M. Godfrey for a few more. From 1904 to 1907 he was a partner in D. C. Floyd & Co jewelers. Then in 1907 he established his own manufacturing jewelry firm in the Collins Building at 2nd and James and purchased his first street clock, a Howard & Company 2-dial. In 1917 Shown moved into the three-year-old Smith Tower next door, Seattle’s first skyscraper. He purchased a new clock from Joseph Mayer for his new store. Street use permits filed with the Seattle Department of Streets & Sewers illustrate the tight competition and dense siting of jewelers in Seattle at the time. Shown’s application was initially rejected because his competitor Knox Brothers simultaneously filed to site another clock within the minimum distance required by law. Shown won out. For the first 4 years his clock was directly in front of the building entrance. In 1921 it was moved 40 feet south. Shown was known as Seattle’s No. 1 baseball fan. He grew up playing baseball in the 1870s in Shown’s Crossroads, Tennessee. According to a 1915 Seattle PI article, he organized the first baseball team in The Dalles, Oregon in 1884. By 1915 Shown was paying the bills for his own semi-pro team, sometimes called the Showns. They played other company teams and town teams in the area and sometimes traveled to nearby cities such as Olympia. The Showns continued until at least 1922. By 1936 he already had the reputation of attending more baseball games than any other Seattleite ever had. He was quoted in a 1956 Seattle Times profile saying that he never missed a Seattle home game until 1950. His daughter Alice became a baseball nut too. She was always at games and so proficient at scoring that she would work as sub for the league if there was an absence. The clock was designed and manufactured by Joseph Mayer, who was a longtime jeweler and wholesaler in Seattle. An 1897 Seattle Post-Intelligencer article about Mayer’s shop was widely reprinted around the United States. It described how Mayer melted into bars some of the gold brought on the Portland, the first of the Klondike Gold Rush. His second-floor space in the Seattle Post-Intelligencer building on Second and Cherry was lined with lead to prevent fire, and he worked in blistering heat to transform $30,000 of gold. Initially Mayer resold E. Howard clocks, then designed his own cases and only purchased the movements. By the time he created the 1917 Stacy Shown clock Mayer was already manufacturing his own clock movements as well. His factory at that time was located behind the Colman Building along Post Avenue. Mayer’s new clock sales ended in 1930, not long after the Black Tuesday stock market crash in 1929. And then his death in 1937 brought an end to Seattle’s golden age as the City of Clocks. From 1901 until Alice’s death the Showns lived at 208 17th Avenue, a short walk to YMCA Park at 13th and Jefferson and Dugdale Park on 12th and Yesler. That house remains handsome today. The 1st clock was apparently purchased by Butterworth Mortuary from Shown in 1917. Its fate after that is unknown. 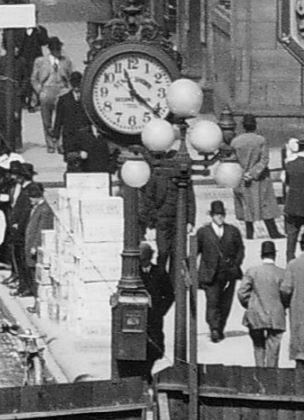 The 2nd clock was moved with the store to 3rd and Columbia after Alice died. The store closed in 1968 and the clock moved to Firdale Village in Edmonds. In 1984 it moved to McBride State Farm in Mukilteo across from Paine Field. In 2017 it was purchased by the St. Louis Street Clock Company for restoration, and is now available. If you’ve got a project that would bring it back to Seattle’s public spaces, I can put you in contact.